Deandre Ayton is a Bahamian Professional Basketball Player who plays in the National Basketball Association (NBA). Deandre plays as a Centre for the American Basketball team Phoenix Suns. He has played for Arizona Men's Basketball team. Deandre Ayton is the first player, to be selected by Phoenix Suns in the 2018 NBA draft. Ayton's current salary is $8.17 million and has the net worth of $5 million in 2018. Deandre is dating a very beautiful girl named Anissa Evans. Deandre Edoneille Ayton was born on July 23, 1998, in Nassau, Bahamas. Ayton's father, Alvin is Nigerian while his mother Andrea is of Jamaican/Bahamian descent. His has four siblings. He moved to California to play high-school Basketball. Ayton played for Balboa City School, where he averaged 21 points and 16 rebounds per game in 2014-2015. Deandre has also played at the 'Nike Hoop Summit' where he averaged 8 points and 7 rebounds. Deandre Ayton used to play as a power forward, for the Arizona Men's Basketball Team in 2017. On March 9, 2018, Ayton made a record of 32 points with 14 rebounds against the UCLA. At the season end, Deandre was named 'Freshman of the Year'. Deandre's professional career began with the Phoenix Suns. The Phoenix Suns selected Ayton with the first overall pick in the 2018 NBA draft. Ayton was the franchise's first-ever no.1 pick. On July 6, 2018, Deandre made a proper rookie-scale contract with Phoenix Suns. Ayton made his first official debut on October 17, 2018, with 18 points and 10 rebounds. He became the second rookie in 40 seasons to score 90% or higher field goal percentage. As per Deandre's rookie contract, he will earn $18 million for the first two years of his career. 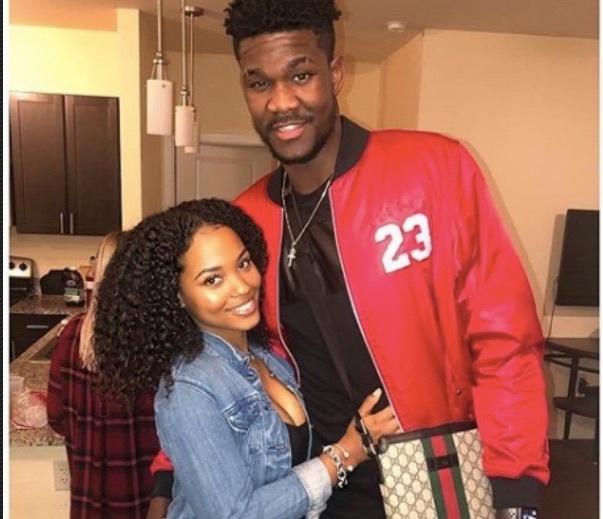 Deandre Ayton is currently dating his girlfriend Anissa Evans. They have been dating each other since their college days. Anissa is Bahamian by nationality. The rising power/center guard is also quite popular on social media. Deandre has 56.3k and 326k followers on Twitter and Instagram respectively. There are not any detailed information about Deandre's Cars collection. Deandre signed a 2 year / $17,728,080 contract with Phoenix Suns in July 2018. The talented center guard has an annual average salary of about $8 million. Ayton is the fourth best-paid player in the Suns' payroll list this season behind Ryan Anderson, Trevor Ariza, and T.J. Warren. In 2019-2020, he is reportedly being paid $9.75 million as his annual salary. The contract also includes a three-year option which will pay him $10 million, $12.6 million, $16.4 million respectively for the three other seasons. Ayton's net worth in 2018 is estimated to be $5 million. In June 2018, Ayton signed a four-year, multi-million dollar endorsement contract with sportswear company Puma. It has been reported, that Puma offered Ayton $1 million to endorse its products. The deal was reported to be most valuable since Kevin Durant's deal with Nike. Deandre used his rookie amount to buy a house for his mom. As of November 2018, Deandre Ayton is 20 years old. Ayton is known for being a physically demanding center with 7 ft. 1 inch tall in height, with a weight of 113 kg. His star sign is Leo.